It was a massive show yesterday, with the youngest son of a reggae legend Bob Marley, Damian 'Jr. Gong' Marley. If you've never been to Damian's concert before, we can describe it with one word only - powerful. You can feel the power and the energy from the second his band takes place and starts playing the instrumental intro. When Jr. Gong comes to the stage, the people go crazy and you can see the rasta flags everywhere. 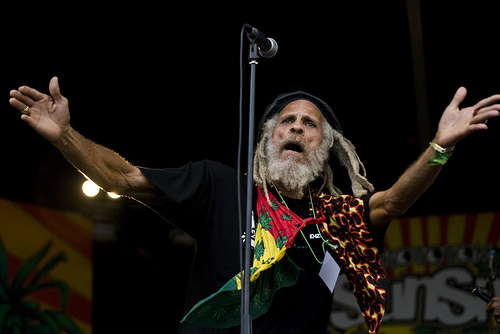 Today is day 5 of the 23th edition of Rototom Sunsplash and we are once again expecting a historical show! The one opening the main stage today will be the living legends of roots reggae music - The Congos (the amazing Cedric Myton, Roy Johnson and Watty Burnett). So do not miss them at 20:45 PM at main stage! More about the happenings behind the music... This year Rototom Sunsplash expanded its camping areas, as there is a new zone for camper vans with independent entrance and space for those coming in groups that want to camp together. There is also a bigger and more comfortable space for families, in which you can find new assistance points near the showers. Rototom Sunsplash is a place for children and there is a special place created for them, where they can create, play, dream and share with the family - the MagicoMundo, a place with deep respect for girls and boys. This year the MagicoMundo area will be divided in 6 different territories, meant for growth and learning. Don't miss the daily activities at the different areas of the festival. You can attend the Rototom Circus school, African drumming workshop, olive wood workshop, glass workshop and many more activities that are happening in the African Village, Pachamama, Artisan Market and Rototom Circus. And of course do not miss the shows at showcase stage, dancehall and dub academy! Stay tuned for more from the biggest European reggae festival, we have 3 beautiful days to go!